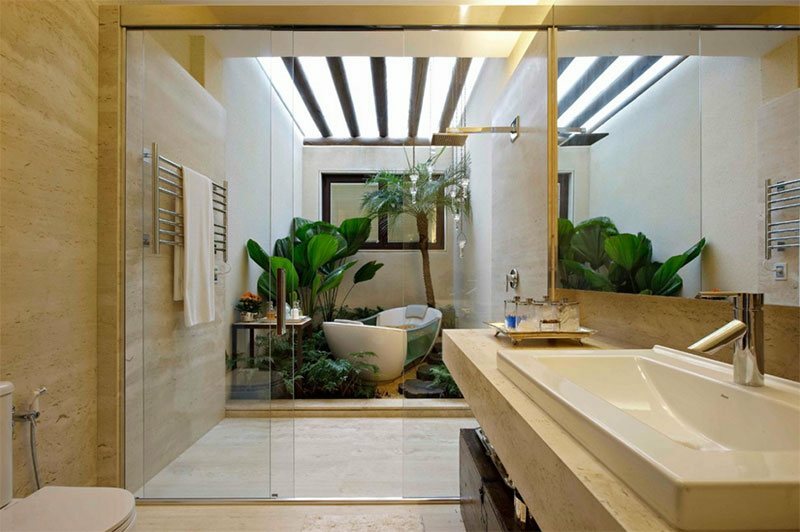 Tropical bathroom usually shows the use of natural material just like wood, bamboo, and stones. The purpose is to create warm bathroom atmosphere that will not only relax your body but also boost your mood. Furthermore, the dosing may have Asian feel or beach-inspired. In other words, tropical bathroom appears with natural color without bold color. It uses earthy tone color and farmhouse elements. Outdoor bath tub with wonderful green scenery around it looks perfect to relax your body. This tropical bathroom design uses boardwalk that look so warm and natural. Further, the lighting makes this bathroom even feel so romantic. Whether you want to take a bath inside or outside, there will be wonderful bathing experience at this tropical bathroom design. With cool white bathtub and outdoor shower, you are given attractive choices for relaxing your body. This bathroom no need more words to say how tropical this design is. Take a look at the roof with beams and the concrete steps with water around. Enjoy the time of bathing with this wonderful bathroom view. If you love indoor bathroom with bathtub and shower in one place you may copy this bathroom design. Look further, there is perfect combination of wooden feature and modern fixtures that make this bathroom appear awesome. Here it is. One more outdoor tropical bathroom that looks vintage but inviting. You can see further at the wooden wall and traditional ceiling design. it appears more than just wonderful with its verandah. Let see this beautiful tropical bathroom design with long water fall from the ceiling. You will feel different bathing sensation at this bathroom. With bamboo wall, this is really Asian bathroom style. Get your body relax at this wonderful bathroom by seeing beautiful garden outside. The glass walls come at the focal interest for this tropical bathroom. Further, the uses of dark stones around it makes this place seems so natural and interesting. Now, you can see an attractive bathroom design that may look appealing for your house. The wooden vanity gives farmhouse feel. Then, the wooden ceiling tells more about tropical style that really eye-grabbing to boost your mood.